Once again we reach the pinnacle stages of the Irish footballing calendar, where four teams will battle it out to cement their place in the biggest game of the year; The Shamrock Bowl. This four part series will look at the teams vying for a spot in the final and how they faired during the regular season, on their way to the knockout stages. So without further ado, first up we have the current champions; The Belfast Trojans. The Green Machine entered the season on the back of a very impressive year, by claiming their second consecutive Shamrock Bowl and adding the Atlantic Cup to their trophy haul. This season may have stopped short of their personal best, but the Trojans know what it takes to win and will always prove to be a difficult team to stop. The Trojans started the season in typical fashion, as they picked up where they left off last term by defeating Northern rivals, the Carrickfergus Knights and Craigavon Cowboys comprehensively. The second half of the season for the Belfast side would prove to be more challenging however, as their unbeaten run came to an end against the number one seed, Trinity College in an 18-0 defeat. This only sparked a new fire in the Trojan camp as they went on to beat North Conference challengers, the Dublin Rebels before putting an emphatic 50 points (for the 50 states!) past the Knights on Independence Day. The Trojans finished the regular season with a 7-1 record, one win shy of going another regular season unbeaten. That record was enough to finish atop the Northern Conference and avoid a wildcard match with the Knights in the process. QB- James McKelvey: With a strong receiving corp, McKelvey was able to produce 13 TD’s in the regular season, adding 3 rushing scores himself! WR- David Richardson: Another good year for the receiver as he topped the SBC receiving charts with 6 TD’s. RB- Neil Montgomery: The hard yards by Montgomery were rewarded with 5 TD’s, expect him to add more in the post season. LB- Neil Graham: One of the top players in his position, he leads the team with the most tackles this year averaging over 8 tackles a game. CB- Jon-Erik Talvio: The former Jyvaskyla Jaguars player has rallied in with numerous interceptions and has scored 2 TD’s in his first year. The Trojans will face off against the University of Limerick Vikings in the first of two semi-final double header in Dublin. 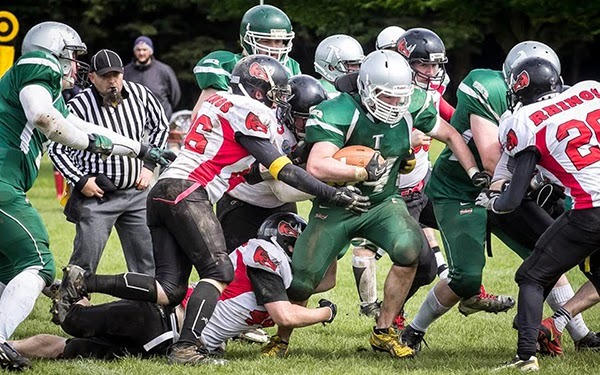 These two sides met at the same stage last season as the men from Belfast defeated the Vikes 14-0 last year in a cagey affair on the way to their Shamrock Bowl triumph. The Trojans will also have fond memories of beating the Vikings 16-14 in SB26 when a field goal was all that separated the sides on the day. A lot of love has been lost over the last two years and when these sides meet this Sunday, expect an intense battle that neither side will want to lose. Kickoff is at 12pm, at Garda RFC, Dublin on July 27th.